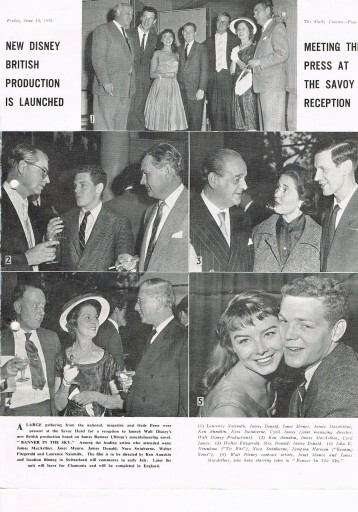 In one of the many magazines of the time I have come across this page with details of the Reception at the Savoy in London for the Walt Disney 1959 film Third Man on The Mountain – although at that time it seems to be promoted under the US title Banner In The Sky. It shows the leading actors and also Director Ken Annakin in relaxed mode. This film isn’t that well known which is a great pity for what is often described as the ‘best film ever about mountaineering. My previous post was about the Film Director Ken Annakin – and he directed this one. Peter Ellenshaw was responsible for the matte painting and was able to give the film that extra edge as he painted in most of the ‘down’ shots during the climbing sequences so effectively that – as I have said in a previous post – members of the audience at a pre-release showing were affected by vertigo and dizziness such was the quality of some of the sheer face shots. 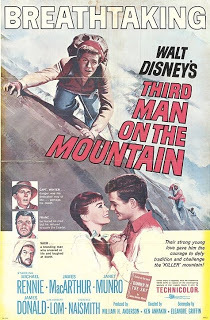 Third Man on the Mountain was released on November 10, 1959. It was a critical success and was highly acclaimed for it’s magnificent location shooting, great writing and excellent performances. Unfortunately, it was a box office dud. It failed to find an audience, which was a shame because it was an expensive film to make. The film was later edited and shown in parts on the Disneyland TV show although this tended to happen with all Walt Disney’s Live Action films. So in a way long before Video and DVD, Walts Disney was able to have two bites at the cherry so to speak even in those days – he had the cinema release and then his own TV channel release. It is a great pity that Third Man on the Mountain never enjoyed success in later years because it really is a great film. Today it is known by most Disney fans as the inspiration for the Matterhorn attraction at Disneyland, but as a film it is well made and very enjoyable. It’s a fairly simple story that is told so well that it’s hard not to find yourself cheering for Rudi. That, mixed with the amazing cinematography and wonderful characters, make this one of the most underrated Disney films of all time. Film buffs should look for a cameo by Helen Hays, James MacArthur’s mother.